The CryptoDark virus is a newly discovered malware that can be deleted easily by following by reading our in-depth removal guide. How Does CryptoDark Virus Infiltrate the System? The first reports of the CryptoDark virus have been reported in the end of June 2017. As the number of detected samples is very low we cannot judge what are the main infection strategies. We presume that the hackers are going to use the most popular methods. One of them is the use of email messages that utilize social engineering tricks. They aim to make the targets infect themselves with the malware by interacting with the messages. The CryptoDark ransomware is either attached or linked in the emails. The used templates pose as legitimate sources by including stolen graphics and text. Infected payload delivery can also be utilized. In this case the criminals bundle the CryptoDark virus code in software installers or office documents. They are either sent via emails or hosted on different websites or P2P networks. Such infections can sometimes be difficult to detect by basic anti-virus products as the user initiates system modification by themselves. Installation of browser hijackers can also lead to CryptoDark ransomware instances. This is usually done after the main browser infection has been complete. These malicious add-ons modify essential settings: the default home page, search engine and new tabs page to point that point to a hacker-specified address. The privacy of the victims is seriously endangered as the malicious code is able to harvest user information. Browser hijackers are made for the most popular applications (Mozilla Firefox, Safari, Google Chrome, Internet Explorer and Microsoft Edge) and can download and transmit to the hackers information such as: browser history, cookies, bookmarks, form data, cache, passwords, settings and account credentials. Related infection sources include web redirects, scripts and ad networks. They are usually part of hacker-controlled affiliate network and can be found on legitimate sites as well. Beware of any flashing images or tempting text that seems misleading or does not originate from the official sites. Direct hacker attacks are also common in some large-scale campaigns. They are usually done in an automated way by exploiting software weaknesses (vulnerabilities). This is the reason why security experts recommend that all users update their software as soon as an update is issued. 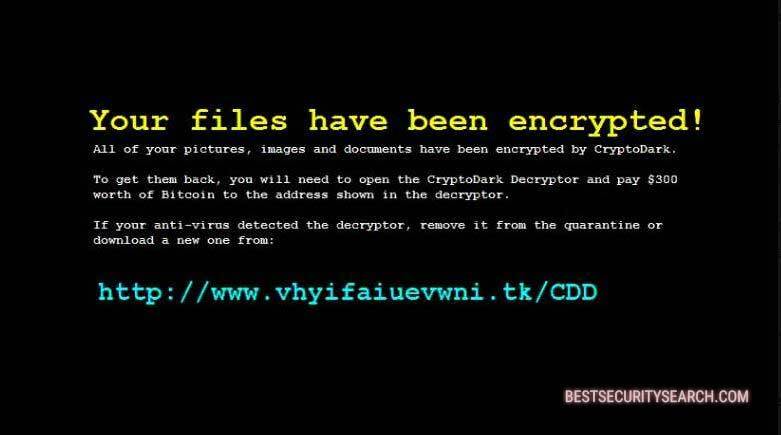 The CryptoDark virus is a newly discovered ransomware. The initial security analysis does not reveal information about the hacker or criminal group behind it. Its code does not seem to be based on any of the famous malware families. This means that it is an independent creation done by the developer(s) behind the virus. At the moment the samples associated with the threat contain only a basic encryption engine that is started after the infection has been initiated. The CryptoDark virus processes system and user data based on a built-in list of target file type extensions. It can be customized depending on the targets or a computer network in particular. There are several versions of the CryptoDark virus. Samples that only pose as ransomware, also known as fake ransomware, have been detected. All of your pictures, images and documents have been encrypted by CryptoDark. If you do not know how to get Bitcoin then click the Local Bitcoins button. Once you have paid, you will be given a key. Click the Decrypt button and enter the key. If it is correct, your files will be decrypted. If you are sure you have typed the key correcetly and you are still unable to decrypt your files, come back tomorrow and it should work. The aforementioned lockscreen instances showcase that the hackers do not quote a fixed decryption sum. Instead they blackmail the victims into contacting them to resolve the issue. This is popular tactic that relies on the amount and type of affected data. The criminals haggle and negotiate a fee with the computer users. Some of the captured CryptoDark virus request the sum of 300 US Dollars paid in the Bitcoin digital currency. We remind victims that such transactions cannot be traced down to any individual. This is the reason why victims should not pay the hackers and resort to using a quality anti-spyware solution. After the virus CryptoDark ransomware infection has been eliminated a data recovery application can be started to recover the affected files. Refer to our instructions below for more information. WARNING! Manual removal of CryptoDark Virus requires being familiar with system files and registries. Removing important data accidentally can lead to permanent system damage. If you don’t feel comfortable with manual instructions, download a powerful anti-malware tool that will scan your system for malware and clean it safely for you. WARNING! All files and objects associated with CryptoDark Virus should be removed from the infected PC before any data recovery attempts. Otherwise the virus may encrypt restored files. Furthermore, a backup of all encrypted files stored on external media is highly recommendable.